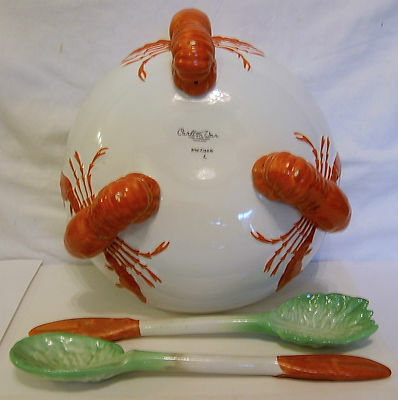 Following on from the earliest 'Lobster' series of tableware produced by W & R Carlton Ware the new more colourful series was introduced as part Carlton Ware Salad Range. Later, in the 1950s, the name was changed to Langouste when, at the same time, two new colours - cream and chartreuse (a variation of pale green) were introduced. 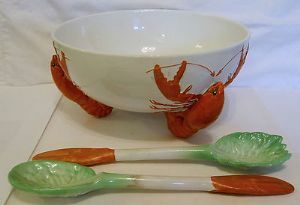 This, then, is the later production in a very attractive cream ground with bright red decorations for the Langouste acting as feet for the Large Round Salad Bowl. Both complementary servers are in excellent condition as is the Bowl itself. It measures approx 8.25 inches (21 cms) in diameter with a height of approx 4.75 inches (12 cms).